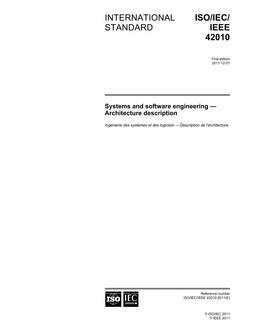 This document describes a software architecture for the firmware that controls a computer before the operating system has begun execution. Typically, firmware is stored in read-only memory (ROM) or programmable read-only memory (PROM), so that it may be executed immediately after the computer is turned on. The main jobs of the firmware are to test the machine hardware and to boot the operating system, usually from a mass storage device or a network. The operating system may also require other services from the firmware. Finally, firmware often provides some support for interactive hardware and software debugging. In addition to the main operating system, other programs, such as diagnostic operating systems, may utilize firmware services. This standard uses OpenBoot PROM Architecture Specification [B6]1 as a starting point, and is bus, vendor, operating system (OS), and instruction-set-architecture (ISA)-independent. Supplements (numbered 1275. x) include specifications for this standarda? ?s application to particular ISAs and buses. This document specifies firmware that controls the operation of a computer system before the primary operating system has taken control of the machine. The material specified includes facilities for determining the hardware configuration; testing, identification, and use of plug-in devices prior to primary OS control; reporting the hardware configuration to the operating system; the user interface for controlling these operations; and debugging facilities for hardware and system software. Additional introductory material can be found in annex F.
New IEEE Standard - Inactive-Withdrawn. Firmware is the read-only-memory (ROM)-based software that controls a computer between the time it is turned on and the time the primary operating system takes control of the machine. Open Firmware provides the following: a mechanism for loading and executing programs (such as operating systems) from disks, tapes, network interfaces, and other devices; an ISA-independent method for identifying devices plugged in to expansion buses and for providing firmware and diagnostics drivers for these devices; an extensible and programmable command language based on the Forth programming language; methods for managing user-configurable options stored in nonvolatile memory; a call back interface allowing other programs to make use of Open Firmware services; and debugging tools for hardware, firmware, firmware drivers, and system software.